Chris Broad was 21 when he made his First Class debut for Gloucestershire in 1979. The veteran Pakistani opener Sadiq Mohammad was injured at the start of the season so Broad got an early opportunity. He began with assured performances against the students of Oxford and Cambridge Universities, which perhaps raised expectations unrealistically. He found the serious business of the County Championship, and the wily old professionals he encountered, rather more difficult and by the middle of June he had lost his place. He went away to the seconds and worked hard at his game before being given another chance at the end of the season. Dropping down to number four there was a fine innings of 96 against Warwickshire in the penultimate fixture and, in the last against Northamptonshire, the debut century was achieved. Wisden commented Young Broad, tried as an opener in Sadiq’s absence, looked promising, and he was really impressive when he filled the number four position in the closing matches. After that Broad’s batting continued to gain admirers, but consistency eluded him and he seemed unable to kick on and secure by weight of runs the England place that so many thought he was capable of gaining. His own view was that the slow and lifeless pitches that Gloucestershire played their home matches on were hampering his development, as was the fact that the England selectors seldom looked so far west anyway, so he made up his mind to leave the county that had given him his break in the First Class game and, at the end of the 1983 season, his best to that date, he left for pastures new in the East Midlands. There were plenty in the West Country who were unhappy at Broad’s departure, and particularly the manner of it and his explanation that he felt he would not be able to fulfill his international ambitions with Gloucestershire. The fact remained however that by 1983 it was a quarter of a century since a batsman from the county, Arthur Milton, had debuted for England, and the selectors treatment in 1983 of his opening partner, Andy Stovold, certainly bore out Broad’s belief. Stovold began the season with centuries in his first two games, and while he couldn’t keep that up in the following weeks he rarely failed. Despite that, and Stovold also being an accomplished wicketkeeper, the unsung Ian Gould of Middlesex was behind the stumps for England in the World Cup, and by July when the first Test against New Zealand began the England openers were a brave Lancastrian with a flawed technique, Graeme Fowler, and Chris Tavare of Kent, turned into an opener by England, but who preferred to bat at first drop. Tavare was gone by the time Clive Lloyd’s 1984 tourists started out on their journey to their first 5-0 victory over England, and in the first Test Warwickshire’s Andy Lloyd opened with Fowler. A sickening head injury meant that Lloyd’s Test career was destined to be a short one, and it was to Broad that England looked when a replacement was needed for Lord’s. He had had nothing like the start to the season that Stovold had had the previous year, and had not scored a single Championship century for his new employer, so his decision to make the switch was clearly the correct one. The bare facts of Broad’s Test debut, a nine wicket defeat, suggest the game was one-sided but in fact, until Gordon Greenidge played one of the greatest of all Test innings, an unbeaten 214 to make a target of 344 look like a stroll in the park, England were well in the game. Fowler and Broad had begun with a rare century stand before Broad was caught down the leg side off Marshall for 55. According to The Cricketer he stood up straight, left what he did not need to play and timed the half volleys well.Broad kept his place for the rest of the series, and in four of his six innings made a start without being able to get past fifty again, but in the inevitable post-mortem that followed England’s crushing defeat skipper David Gower described Broad as one of the larger positives to come from the series. No doubt buoyed by Gower’s comments Broad scored a fine 86 in the last Test of the summer, the first in England against Sri Lanka. Despite that perfectly respectable first Test season Broad did not get a place on that winter’s tour of India, Gower being outvoted by his fellow selectors on the basis of Broad’s perceived lack of expertise against spin. One of the opener’s who was chosen was Broad’s opening partner at Trent Bridge, Tim Robinson, who did well in India and held his place for the 1985 Ashes. Robbo then averaged more than 60 for the 1985 Ashes to cement his England place and despite being a model of consistency in the Championship Broad was not needed. He missed out too on a tour of the West Indies in 1985/86. He might have been pigeon-holed as a specialist against pace, but not sufficient to stop the uncapped David Smith, one of the great characters of the English game and a noted player of fast bowling, getting the last batting place. Broad’s omission from the England ‘A’ tour to Zimbabwe was more surprising. Despite his reputation there was no outburst from Broad at his being overlooked in 1984, nor in particular the fact that he only found out about his omission from the party to India on the radio. Gower had tried to telephone him before the announcement was made, but there were no mobile devices in those days, and Broad wasn’t at home. The England captain did catch up with his disappointed teammate about a week later, and subsequently wrote Broady being a forthright sort of character, I feared the worst when I finally did make contact, but in fact he was very good about it. In the winter of 1986 Broad could have been forgiven for sitting at home and sulking over his treatment by the selectors but he didn’t. Instead he accepted an offer to travel to South Africa and captain Orange Free State in their first season in the top flight of the South African domestic competition, the Currie Cup. Although Free State shared the wooden spoon with Border Broad, dropping down to the middle order, batted pretty well and led his inexperienced teammates unselfishly. England have had few summers as bleak as 1986 when India won a three Test series 2-0 and, for the first time ever, the New Zealanders won a series too. Graham Gooch’s place at the top of the order was secure, but the best man to share the job with him was totally unclear. Robinson, Wilf Slack and Mark Benson were tried and discarded against India. Martin Moxon at least had two chances against New Zealand, but he didn’t grasp the opportunity, and Bill Athey was less than impressive in the final Test of the summer after being moved up from number three. It wasn’t even clear whether Broad was next in line behind that lot given that for the match for which Benson was called up Wayne Larkins had been the original choice as opener. Despite his congenial employment in Free State over the winter Broad did not start 1986 particulary well. Perhaps it was the anticipation of the birth of son Stuart, who eventually put in an appearance on 24 June. Four days later Broad hit his low point of the season with a pair against Leicestershire, but he then went on to score four hundreds over the rest of the season and his thoughts turned to the announcement of the party to tour Australia that winter. Understandably in light of previous experiences Broad was taking nothing for granted as he sat by his radio, preparing himself mentally for the announcement of the squad, but in the end he didn’t need to listen, a phone call from Mike Gatting confirming his selection coming through shortly beforehand. There are only three things wrong with this England team. They can’t bat, can’t bowl, and can’t field. opined journalist Martin Johnson in The Independent. If it was intended to inspire it certainly had that effect as Gatting’s men took the series rather more comfortably than the 2-1 scoreline suggests. For Broad the series was a triumph and was the main reason for his earning the title International Player of the Year. He recorded his first Test century in the second match of the series and, just to prove that was no fluke, he got to three figures again in each of the next two Tests. The reasons for his success were succinctly summarised by John Thicknesse in his report of the tour for Wisden; His height, composure, concentration and sound technique were well suited to Australian pitches. The following season England’s opponents were Pakistan. Broad had to pull out of the squad for the first Test when he broke his thumb. Perhaps he came back too early as he never really got going in the other four Tests. There were two fifties, and a couple of other starts as well, but a top score of 80 for the entire season would have been a disappointment after his work in Australia. Another winter with England was, of course, a certainty but it became Broad’s winter of discontent. Not so much because of the number of runs he scored, and in fact after losing his place in the World Cup side he came back to enjoy a decent run in the Tests in Pakistan, Australia and New Zealand, but as a result of the on field controversies in which he found himself becoming embroiled. The series in Pakistan had trouble written all over it from the off and so it came to pass. England had objected to the local umpires appointed for the first Test but, with the same haughty manner as had greeted a similar protest from Pakistan in England in 1987, the concerns were ignored. For Broad there was a long vigil in the first innings of the first Test as he top scored for 41, watching a number of his teammates suffering poor decisions. When his turn came to be on the wrong end of a poor decision in the second innings he simply refused to leave the crease, and it was over a minute before partner Gooch persuaded him to do so. Pakistan called for Broad to be sent home, but that request was treated by England with similar disdain to that which their request for a change of umpire received. Broad received an official reprimand, although it must be doubtful whether the management’s heart was in it. The tour manager told the press his action was the culmination of frustrations which had built up within the team over the previous three days, so Broad played on. The second Test has become famous for the Furore at Faisalabad. The Gatting/Rana incident made all the headlines, rather than the accomplished century that Broad made in the first innings. All bar eight of the overs in that England innings were delivered by the mercurial wrist spin of Abdul Qadir, the slow left arm orthodox of Iqbal Qasim, or the off spin of Tauseef Ahmed, so it must have been a satisfying innings for a man who just three years previously hadn’t been considered a good enough player of spin to be taken to India. Three months later Broad was in trouble again, at the one off Bicentennial Test in Australia. England batted first and, not without some good fortune along the way, Broad ended the first day unbeaten on 116. It was his fourth century in just six Tests in Australia. Sadly he was never destined to play another one. The trouble came on his dismissal next day at 139, bowled off his body by Steve Waugh. Broad’s frustration, for it can only have been that, was to smash the leg stump with his bat. This time, with no extenuating circumstances, Broad was hit with the maximum fine available to him by tour manager Peter Lush. The last part of England’s winter was taken up by a three Test tour of New Zealand. All the Tests were drawn and it was a colourless encounter. Broad never played a full series again, but he averaged 51, and scored the last of his six Test centuries, all recorded overseas. He was not yet 31. The West Indies, winners of ten consecutive Tests against England, were the visitors in 1988. The summer started well for England who thoroughly deserved their draw in the first Test, a fifty from Broad being one of the useful individual contributions made. After that however everything fell apart after Gatting’s dalliance with a barmaid cost him the captaincy, and a combination of some seemingly panic-stricken selectorial decisions and superb cricket from the visitors turned the remaining four Tests into a procession. Broad scored 0 and 1 in the second Test at Lord’s and he was dropped. It was one of the less explicable decisions made that summer. Broad had shown beyond a shadow of doubt that he was international class in the preceding four years whereas the record of his replacement, Martyn Moxon, amply demonstrated that the Yorkshireman was not quite good enough at the highest level. In the first innings at Lord’s the television cameras had closed in on Broad following his lbw dismissal, and no great ability to lip read was required in order to gauge the level of his dissatisfaction with the decision. 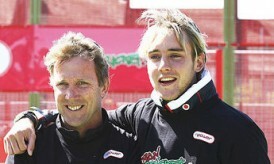 Many felt that, after his antics in the winter that in truth Broad’s demotion was disciplinary rather than tactical. Broad had troubles at Trent Bridge as well in 1988. When he had joined Notts they were the county of Clive Rice and Richard Hadlee, then as now two of the most respected figures in the game. In 1987 the two signed off with the County Championship and left a yawning chasm at the top and the question, in partcular, of who was going to succeed Rice as captain. in his 1987 autobiography Broad had made no secret of his interest in captaincy and he may well have expected that his experience in South Africa would tip the balance in his favour. He was certainly disappointed when the job went to his opening partner Robinson. The problems came to a head in July when Robinson scored a superb century to take Notts to victory over Worcestershire. From that position of strength he then resigned the captaincy, and would only resume it if decisions he wanted to see made were implemented. One of those demands was the dropping of Broad, who thereby became branded as the main troublemaker. How the mighty are fallen – Broad went from opening the England batting in front of a full house at Lord’s, against the best team in the world, to facing Essex Second XI at Worksop watched by a handful of diehards in little more than a month. Despite taking most of the flak for what happened Broad was undoubtedly not the only senior player at fault, and he told his side of the story of the resignation in a book published under Ian Botham’s name only last year, Beefy’s Cricket Tales. According to Broad Robinson had sought his advice before his masterly century in the second innings, and Broad had suggested he resign, the implication being that that was as much for Robinson’s benefit as much as the team’s. Robinson called for a dressing room vote of confidence following the victory, garnering the support of only four or five of the squad before then playing his trump card. The off-season of 1988/89 was something you never see now, a winter without an England tour, so for the visit of the 1989 Australians, trying to recover the Ashes that Broad had played such a large part in England’s retaining in 1986/87, there was no established unit. England began the series as favourites, but were thrashed by the side that Alan Border had patiently built up in the intervening years. Broad had a superb start to the summer, falling early just once in a Championship innings before the first Test. He started the series in his familiar slot with Gooch at the top of the order, and got three starts in his four innings in the first two Tests without going on and, after two heavy defeats, it was he who paid the price and was dropped. After he was dropped the selectors found themselves in trouble when injuries robbed them of Alan Lamb and Robin Smith, and a family bereavement of Mike Gatting. Broad really should have been recalled, but he wasn’t, and that selectorial decision doubtless played its part in the chain of events that resulted in his never playing Test cricket again. It was Worcestershire’s Tim Curtis who opened with Gooch in the third Test, and in a rain-ruined encounter he did enough to hold his place for the next two Tests, after which he was discarded. With Gooch struggling for form and rested after the fourth Test Broad might have come back for the fifth had not the news come out that he was one of those “rebels” who had signed up to tour South Africa in the following January. The five year ban that followed was what effectively ended his Test career. It was an understandable decision by Broad. He had suffered as much as anyone from the vicissitudes of the selectorial process and, with a young family, the promise of a single payday which was the equivalent of the combined match fees for each and every Test match over the next six years, his choice to forego whatever may be left of his Test career cannot have been a difficult one. His Test career over it did seem that controversy may have stopped stalking Broad and he did his best to let his bat do the talking. In 1990, having clearly overcome his understandable frustration at being singled out for the punishment he got after the resignation incident, he had his best ever season. He scored 2,226 runs at more than 54, all of them in the County Championship. There were nine centuries along the way, including an unbeaten 227 against Kent, the highest score of his career. The following seasons were never going to top that, but for 1991 he averaged all but 50 again. In 1992 he had recorded five centuries and was averaging more than 43 when in mid-August he found himself sacked without warning. The decision was made by former England pace bowler Mike Hendrick, newly in charge that summer, and doubtless related back to the difficult relationship between Broad and Robinson. Former England off spinner Eddie Hemmings was dismissed at the same time, so at least this time Broad was not alone. There were plenty of counties interested in signing a man who had scored a total of 19 hundreds in the last three seasons, and it was a real surprise when he chose to return to Gloucestershire, less than a decade after he had caused so much ill-feeling by leaving. There were richer counties with stronger playing staffs who were interested, and given that the original ban for travelling to South Africa had by then been lifted leaving open the possibility of a return to the England side, it was a real surprise that he opted for a return to the county he perceived as having held him back. Unfortunately for Broad and Gloucestershire neither got what they hoped for from the reconciliation. In 1993 Broad averaged only 34 and scored but two centuries. By the following summer the reason was known. Broad had been diagnosed with a degenetrative hip condition that restricted his mobility and as a result he was not considered for the Sunday League side. He began 1994 well enough, and at the beginning of May scored a fine century against a Sussex attack that contained four Test players as well as a West Indian who undoubtedly would have been had he not gone to South Africa, Franklyn Stephenson, but it was a false dawn and by the middle of July he had played for the first team for the last time. In the close season of 1994/95 Broad opened a wholesale wine business, but still expected to honour the final year of his contract with Gloucestershire. It was announced however that he was to be released from that. He was quoted in The Cricketer as saying I think I am fit enough to play, but they don’t and I will be seeking legal advice. Thus his second departure from the county was, albeit for very different reasons, as acrimonious as the first, although any legal issues must have been settled amicably, as no litigation ensued. One consequence was that a man who had played 25 Tests and graced the First Class game for a decade and a half never had a benefit, amply demonstrating how sensible his decision to go to South Africa had been. I do not know how long the Broad wine business existed for, or indeed whether or not it succeeded at all, but certainly it was not long after his retirement that he became part of the BBC Television commentary team, and he also authored a book on that particular subject. The BBC were of course set to lose Test cricket, and once that happened Broad was employed by the ICC as a match referee. To date he has fulfilled that function for 60 Tests and approaching 250 ODIs. He had the misfortune to be refereeing the Pakistan/Sri Lanka Test that was ended by a terrorist shooting in 2009, but he has not been cowed. His private life has not always been easy either. His second wife, who suffered from Motor Neurone Disease, took her own life in 2011. It was her choice, and one which English Law allowed Broad to take no part in. He has subsequently given evidence to the Falconer Commission on Assisted Suicide, a wide-ranging enquiry that, hopefully, will eventually be responsible for a change in the law that will ensure that in the future in circumstances such as those arising in Michelle Broad’s case it will not be necessary for those who make the hardest decision of them all to die alone. Broad’s life had been touched by tragedy before. An older brother, apparently fit and healthy and a fine Rugby Union player had died of a heart attack in his twenties. In addition the teenage Broad had been on the danger list as well, suffering from Osteomyeletis after a Rugby injury had not in fact cleared up when he thought it had. It was a hip injury, so perhaps it did eventually come back to haunt Broad and finish his career. At least that one did not prey on Broad’s mind during his hospitalisation, his parents not sharing the worst case scenario with him until he was well on the road to recovery. Today Broad doubtless derives his greatest pleasure in life from watching son Stuart performing for England. Clearly a chip off the old block in terms of temperament, Broad the younger has however enjoyed the sort of support from the England management that his father never had. As a result at just 27 Stuart has already played nearly three times as many Tests as the old man, and unlike Dad has had most of his best days in England rather than overseas. So it is inevitable that with his most stirring deeds fresh in the mind most will consider Stuart by some distance the greater cricketer of the two. But Chris Broad was a very fine opening batsman indeed and, with more sympathetic treatment by the England selection committee of his time, would surely have ended up with a much more prolific record than he has. One thing of which I am certain is that Andy Flower and Graham Gooch would have given much to have had a man with his qualities available to them this winter. Slight quibble: Ian Gould was at Sussex, not Middlesex, when he played for England. And it’s the first time I’ve seen Broad’s 86 in nearly 6 hours against Sri Lanka as “fine” (though it was understandable at the end of a tough summer).